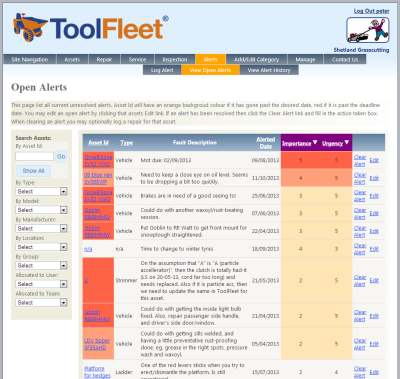 ToolFleet is an online organiser for inspections, servicing and repairs. It help managers to save money, by reducing risk, extending asset life, and improving day-to-day efficiency. Optimise inspection and service intervals – Automatic scheduling helps prevent the untimely demise of your assets. Streamline processes – All your staff can easily access and update asset data, anywhere, any time, using mobile browsers, laptops etc. Engineers have easy access to information, helping them to prioritise and organise tasks. Control risk – Helps prevent expensive accidents, by reducing the risk of defective plant (assisting compliance with PUWER and LOLER regulations). Helps achieve standards such as ISO 9001, OHSAS 18001, and ISO 14001. Good vibes – When you attach ‘HAVS points’ to each asset, your staff could also potentially use ToolFleet’s sister application, VibeCalc, to calculate and log Hand Arm Vibration exposure online. Interface with it online or on paper – Accessible anywhere with an internet connection (including your mobile). The paper forms it produces are an essential feature, for use by less tech-savvy staff, for sites with no internet connection, and for harsh environments. You can also download copies of your info in Excel format, for use offline. Value – It’s an efficient little bit of software, so our prices are considerably cheaper than our competitors’. Yay! Harness your asset information – Your staff log any problems they encounter into the system, setting target-dates and categorising the importance of each issue. The system automatically prioritises these “alerts”, so that the most important and urgent repairs and suchlike get dealt with first. Schedule maintenance – By inputting each model’s various service and inspection frequencies into the system, it then automatically schedules and prioritises all ongoing servicing and inspections. Ease of use – Nothing to install, and it’s free to set up an account, so you can try before you buy (see our costs page), or use it free forever if you have less than five assets. Easy to use, with intuitive navigation, on-screen instructions, online ‘how-to’ guides, and one-click-sort-and-filter. 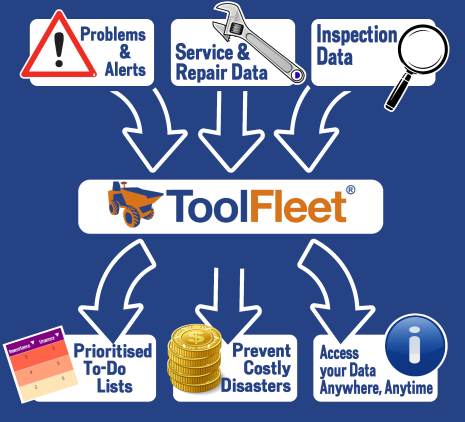 If you have your assets listed in a spreadsheet or database already, you can easily import them into ToolFleet using our ‘batch’ upload facility. It’s also incredibly easy to set up similar service intervals for a large number of similar assets (eg, ‘annual service’), all in one go, rather than having to do them one by one. Versatile – Suitable for any type of vehicle, machine, tool, building, or other piece of equipment. Contractors – Ideal for small to medium-sized firms needing a simple, easy to use solution. Scales up effortlessly to larger organisations as well. Perfect for building firms, grounds-maintenance contractors, civil engineers, municipal organisations, fleet operators, landscape gardeners, etc. Facilities managers – Makes it easy for all the staff in your organisation to log a request, when they find problems with your building or assets. Makes it easy for you to prioritise and schedule all your organisation’s inspection and maintenance tasks. The purpose of an inspection is to identify whether the equipment can be operated, adjusted and maintained safely and that any deterioration (for example defect, damage, wear) can be detected and remedied before it results in unacceptable risks.” – quoted from HSE’s document, the Safe Use Of Work Equipment, Provision and use of Work Equipment Regulations 1998 (PUWER), Approved Code Of Practise and guidance. An effective maintenance programme will make equipment more reliable. Fewer breakdowns will mean less dangerous contact with equipment is required, as well as having the cost benefits of better productivity and efficiency. LOLER requires lifting equipment to be maintained so that it remains safe and that maintenance is carried out safely.” – quoted from HSE’s document, Lifting Equipment At Work, a guide to LOLER Regulations 1998.